How do I search a file using “less” for a value with a decimal point? I've since learned less uses regex, so . is a wildcard. I've tried to escape it with no success. will do the trick (inside less). do a simple textual comparison. 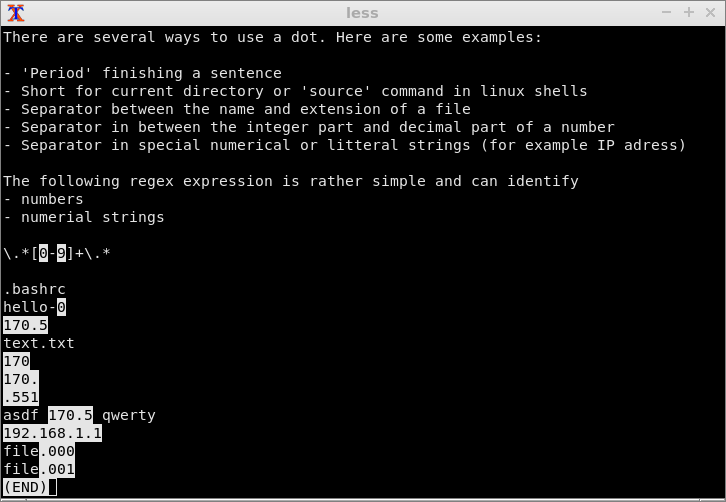 This regex works in less but also in other cases where the same regex syntax is used. It will also find numerical strings (for example IP address), in general digits after a dot (including digits before the dot, if any). Not the answer you're looking for? Browse other questions tagged regular-expression less or ask your own question. How to indicate start of line in less search of man pages? Where is less search pattern reference? How to search for a pattern using grep?